Another Polocrosse ‘first’ is coming to Warwick. The host of the first ever Polocrosse World Cup, Morgan Park, will soon be home to another first - the International or Australian Polocrosse Museum. 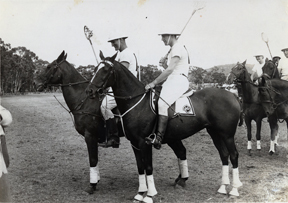 The museum will showcase a vast array of polocrosse artefacts and memorabilia from across Australia and the world. The highlight of the museum will be a collection of personal polocrosse items of the founder of the game, Majory Hirst – dating back to the 1940’s. “Polocrosse was born and bred in Australia and it’s important that the history of the game is collated in one location – for everyone to enjoy,” said the President of the Polocrosse Association of Australia, Gill Mathie. Mr Mathie also said that there has also been strong support from all states in Australia and as a result an exhibition for each state would be established within the Museum. “Morgan Park is the leading polocrosse facility in the world, so it was obvious fit that the Polocrosse Musuem be located there as well,” Mr Mathie said. POLOCROSSE - AUSTRALIAN MADE – INTERNATIONALLY PLAYED! MEMORABILIA REQUIRED FROM ALL STATES - This is a display of history of Polocrosse across ALL states!! Image 3:Jack Reilly on "Soda" and Max Walters on "Sally" at Stawell 1956.